Is your stove's heat output right? Here's how to work out the required heat output in kilowatts (kW). Multiply your room's length, width and height in metres, then divide the total by 14. That will give you an average heating requirement in kW. A popular addition to the home, stoves are perfect for helping create that warm and cosy feel that so many of us crave during the winter. While traditional style woodburners tend to be the most sought-after, it's worth considering some of the more contemporary multi-fuel options if your interiors taste is more modern, or if you want a (mostly) maintenance-free stove. 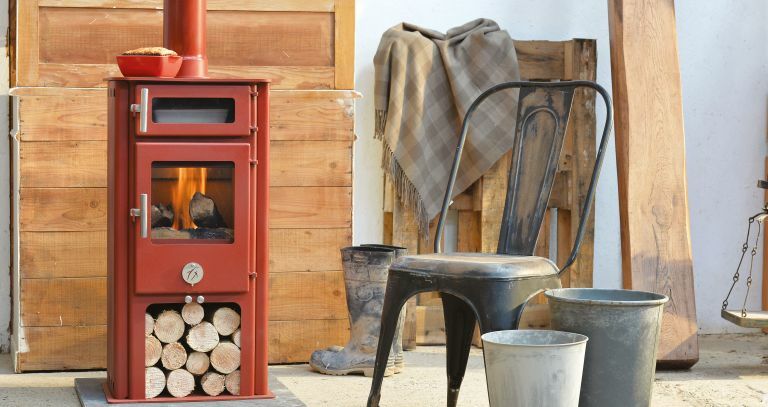 We've rounded up our pick of the best stoves for you to browse; use our guide to choosing a stove to find the best one for your home, too. What are the latest rules regarding stoves? In their Clean Air Strategy, published in January 2019, the government outlined an ‘ambitious strategy’ to tackle air pollution, with restrictions on open fire fuels and some log burners, with the worst banned, and only the cleanest permitted to be sold after 2022. Find out more in our stoves news piece. If you're looking to design a space that's unrivalled in its cosiness, you can't beat a traditional stove. In addition to offering warmth this winter, a more traditional design is timeless, and you'll love it just as much for years to come. It will look good, too, throughout spring and summer when it's not in use. In other words, it's more than just a heater – it's a desirable home accessory. Redesigned from Charnwood’s classic twin-door model, this clean-burning, multi-fuel Island 5kW Stove has all the charm of a traditional cast-iron stove, but also looks perfect placed in an industrial setting. From £1,495. If you're working with a light-coloured scheme – think whites, greys and blues – and want to retain the paired back and minimalist feel that often accompanies them, consider opting for a stove in a similar shade. Just because you live in a contemporary home, it doesn't mean you can't enjoy a more traditional style stove. In fact, the combination of modern interiors with more traditional shapes and styles can be an easy way to add character and interest to your home. We love this combination of a sleek fireplace with a slate hearth and the Parkray Consort 9 9kW Multi-fuel Stove, £1,139, which is available from Hunter Stoves. Woodburning stoves can only run on wood; multi-fuel stoves can run on wood, smokeless fuels or coal. Check before you buy. While it may be tempting to buy the largest stove you can afford, this isn't necessarily the best approach (especially if your space is on the small side). Be mindful of the fact that a larger model will make a small space look smaller and a smaller model will look out of place in a larger space and opt for a burner that's size appropriate. The Purevision Classic CPV5 Multi-fuel Stove, which starts at £1,599, slots perfectly into this fireplace – with plenty of space either side – meaning it doesn't look over- (or under-) whelming. Whether you’re into clean lines or unique shapes, a modern woodburning stove is the perfect way to bring warmth to a contemporary home. If you're short on space or want to ensure that your woodburning stove suits your stripped back, simple style, look no further than the 5kW Bornholm Stove from Varde. It's sleek, stylish and doesn't take up too much space. From £1,195. For a stylish (and space saving) alternative, we love the idea of mounting a woodburning stove on the wall to create a more dramatic focal point. Opt for a sleek and slimline design, like the Vogue Midi T 5kW Woodburning Stove from Stovax. Available from £1,839 as a freestanding model, or wall-mounted. If your taste in interiors is stylish and understated, opt for a stove with a simple design – we love the idea of pairing a stove with a simple silhouette and a more dramatic surrounding decor. Find this CL5 Wide 5kW multi-fuel stove from Yeoman. From £1,279. A new generation of cylindric woodburning stoves is transforming the way we use them in our spaces. Whether you want to show it off from all angles or need an architectural feature for an empty corner, curved woodburners are beautiful and practical. This Morsø 6643 5.9kW model is making us long for those chilly winter days. From £1,990. The contrast of a dark finish woodburning stove against a light coloured scheme is an easy way to create a striking focal point within a space. Opting for a sleek design will ensure a contemporary look that's not too over-the-top. The minimalist M2ST 6kW woodburning stove from Lotus is distinctive thanks to its simple design and black steel finish. From £3,745. It doesn't get much more statement than a 360-degree woodburning stove; which would work particularly well in a space with a distinctly contemporary feel. Looking good from all angles, Focus Fireplaces’ Agorafocus 630 8-11kW woodburning stove has glass panels going right round it. From £6,924. Are you allowed to burn wood? If you live an a smoke-control area, you can use wood only if your appliance is DEFRA-exempt, which means it meets the low emission requirements. Find out more about smoke control rules. If you're ready to make your woodburning stove the centrepiece of your room, nothing says statement like a daring pop of colour. We love the idea of pairing a brightly hued woodburner with a similarly striking paint scheme to add instant impact to your space. The Farringdon woodburning stove in Spice from Arada is a good start – either go bold with a feature wall behind it or tone down with neutrals. From £1,245 for the small 4.9kW model. Being short on space doesn't have to mean compromising your dream of having a woodburning stove; it just means finding a small, slimline model. Chilli Penguin’s High and Mighty 5kW Woodburning Stove not only fits the bill size wise, but it comes in a choice of colours, so you’ll find a shade that suits your scheme. It costs £1,769, Ludlow Stoves. Like the idea of colour, but not keen on bright and bold? Consider opting for something a little more muted – we love dark blues – paired with a more neutral scheme to add interest without overwhelming the space. Clearview’s Pioneer 400 4kW multi-fuel stove, shown here in Welsh Slate Blue, is available in a range of subtle options. From £1,182. If you live for quirky designs and unique pieces, don't compromise when it comes to choosing a woodburning stove. Dare to be different with this striking Piazetta Bonny woodburning stove in the colour Anice from Robeys. We love the idea of slotting it into a space with a Mid-century feel. From £3,366.